Cheers to this server for serving up high-end design, minus the attitude. The look might be ultra sleek and contemporary, but with an easy-on-the eyes “smoky” finish, it exudes a casually cool vibe that feels at home. Sliding doors with linear pulls add a dash of mid-century flair. 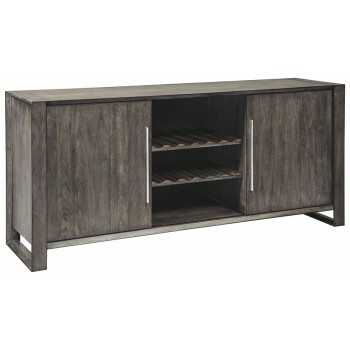 With space for 12 wine bottles, utensil drawers and adjustable shelving, it serves your entertainment needs beautifully.